Aw, Judy B… She holds a sentimental place in my heart as I’m sure she does in the hearts of many who have read her books. 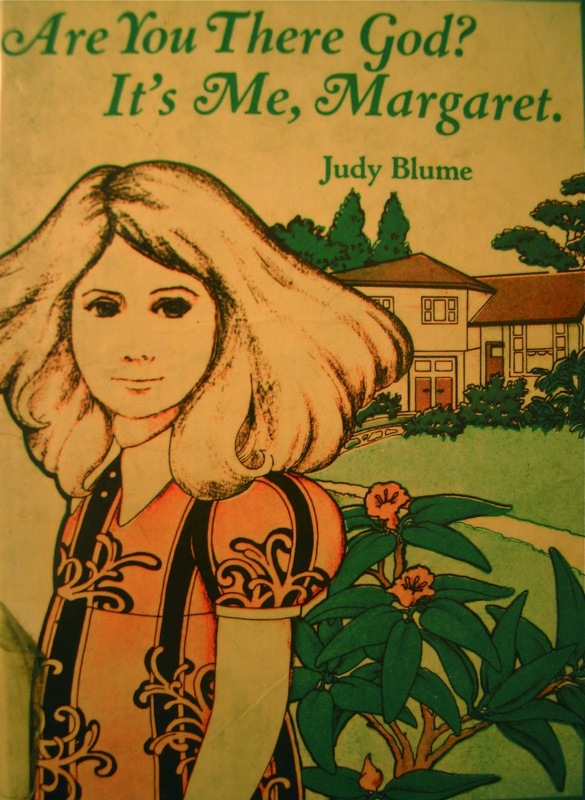 Who understands being a teenager quite like Judy Blume? My Adult Young Adult Book Club decided to have a “Judy Blume” theme for the month of February and read Forever and Are You there God? It’s Me, Margaret. I am going to talk more about Are You There God, It’s Me, Margaret but wanted to give a shout out to Forever and just say that for me it was very accurate about the experience of first love and “first time” experiences. I also really appreciate that Judy B wrote a book in which teenagers were sexually active but were being safe about it and even went to Planned Parenthood. I think that’s a really great example for sexually active teens. I had read Are You There God, It’s Me, Margaret as a young teenager and it was an interesting experience to go back and read as an adult and to relate to it with a more mature understanding. I never understood (and still don’t understand) why those girls wanted to get their periods so badly! Oh man, I could do without! It seems they have updated the book somewhat because I remember when reading it as a teenager there were descriptions of what pads were like back in the day. Something to do with having to wear a belt with a pad which sounds very mysterious and difficult and uncomfortable. In the updated version, they seem to have more modern pads although they are called things like “Teenage Softies!” Oh man, the embarrassment! I also remember that as a young teenager I did try the “breast enhancing” exercises in the book but was too embarrassed to repeat the mantra: “We must we must we must, we must increase our bust!” Who could forget that?!! (By the way, those exercises didn’t work for me, ha ha)! Surprisingly, one of the parts that I realized I relate to the most as an adult is Margaret’s search for religion and growing up in a household where the two sides of the family are divided along religious lines. In the book, Margaret’s grandmother is Jewish while her other grandparents are super Christian. Her parents have decided not to practice any religion and to let Margaret choose for herself. Margaret investigates a few different religions for a class project but never really decides on one. This is a tough issue for her though because she feels pressure from both sides of her family to pick a religion and it seems that all the kids in her surrounding community have a religion. She does have her own kind of relationship with God though and speaks with them often and especially when she needs help with something (like asking God to please let her get her period!). This part of the book reminded me a lot of another coming of age narrative, the graphic novel Persepolis by the author Marjane Satrapi, in which the protagonist also speaks with God and has her own special relationship with him. As a kid, I grew up in similar circumstances to Margaret. While my parents are both non-religious (although I guess my Mom does sometimes attend mass on Easter or Christmas), my Dad’s whole side of the family are Latter Day Saints (otherwise known as Mormons) and my Mom’s whole side of the family are Catholic. Additionally, I grew up in Salt Lake City, Utah, where the majority of my peers were Mormon. We were closer to my Dad’s side of the family growing up and I remember that there was always the pressure to become Mormon. Like Margaret, I did try religion for a little while such as going to mass with my Mom a few times and even got baptised in the Mormon church when I was 12 but ended up dropping out after a couple years. It just wasn’t right for me and especially as a queer I disagree with some of the beliefs (and am still angry about Prop 8). However I actually think I learned some pretty great values from growing up in a Mormon culture such as the value of family and having a strong support system. The way Blume touched on religion in this book was always one of my favorite things about it. Reading your post I realised that my relationship with God kind of developed into something a lot like Margaret’s. It’s personal and exists outside of the constructs of a church and a religion. Blume just gets it. Congratulations on Josh returning, by the way. I know Jeremy was very surprised to hear he’d be going on a mission, and wishes he could be there to see him now. I even remember that when we were first speaking on the telephone, Josh was the only person he told about me. I know your brother holds a very special place in his heart. Tell him hello from us and welcome back! Hopefully we can make our way back to Utah to visit soon. Hey Sarah, I really like what you said about a relationship with God being personal and existing outside the constructs of a church and religion. I feel that way too. And yeah, Jeremy and Josh were pretty close growing up. I think Josh probably was the first to know about you and it gradually leaked throughout the family, ha ha. I’m sure that Josh would love to see Jeremy too. I will tell him hello from you guys. And you guys are always welcome to come visit me in Portland too!